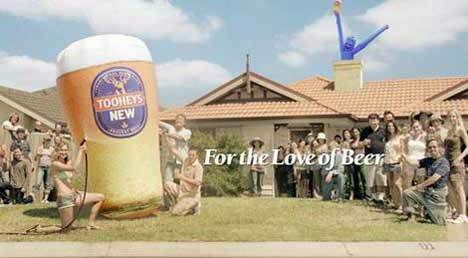 Tooheys New introduced a street party to Australian television screens tonight, featuring multi-coloured wacky inflatable arm-flailing tube men (tall men) grooving to the sounds of Tom Jones’ 1968 hit “Help Yourself”. This is the second instalment in the “For The Love Of Beer” advertising campaign, following the Catapult ad which was launched in February 2006. The Tallmen Street Party has all the hallmarks of the previous ad: larger-than-life figures, colour, partying adults, and a stag. The “Tallmen” ad has been released online at fortheloveofbear.com.au and can be viewed in Vividas format. The Tallmen campaign was developed at Saatchi & Saatchi, Sydney, by executive creative director David Nobay, art director Pete Buckley, copywriter Tim Brown and agency producer Scott McBurnie. Filming was directed by American Tom Kuntz, via MJZ and Walkabout Films, with producer Nell Jordan, director of photography Seamus McGarvey, executive producer Lizzy Nash and line producer Karen Watson. Tom Kuntz was earlier this year nominated by the Directors Guild of America (DGA) for an award recognizing outstanding directorial achievement in documentary and commercials for 2006. Unfortunately due to his filming schedule with the Tooheys ad he missed the awards ceremony. The award was given to his MJZ colleague Dante Ariola. Post production was done at Guillotine (Stuart Reeves) and Fanatic Films. Music Production was done at Nylon Studios. Thats what I want you to do.